A book that changed my life! As I sit at my desk typing this letter, I have in front of me an austere looking volume bound in grey cloth with a black label on the spine. The gold lettering on the label proclaims the title: Banner of Truth, Vol 1, Issues 1-16. I bought the book a few weeks ago. I was browsing along a church bookstall before a meeting. The books on sale were mostly new but at one end I saw a small pile of second-hand volumes. And on top of the pile, lay this: a bound copy of the first sixteen issues of the Banner of Truth magazine. My hand trembled as I reached for it. And as I opened it, I was carried back in time. Suddenly I was a lad of sixteen again lying on the floor of my bedroom with a copy of the same book in front of me. I had found it on my parents’ shelves, taken it down in idle curiosity, and found myself captivated. Reading that book more than thirty years ago changed my life. It was from that book that I discovered historic evangelical Christianity – the Christianity of the Reformers, the Puritans, the leaders of the 18th Century Evangelical Awakening, the Christianity of Murray McCheyne and John Elias and Thomas Charles of Bala. It was a devastating experience. Before I opened that book, I cheerfully assumed that the Christianity I knew, the Christianity I believed, was the faith of Christians all down the centuries. How humbling it was to realise that there was a whole broad stream of evangelical Christianity of which I knew nothing. Reading that book forced me to see that our evangelical forefathers believed totally in the sovereignty of God. I found these words from Arthur Pink: “The God of Scripture is absolute Sovereign. Such is His own claim: ‘This is the purpose that is purposed upon the whole earth: and this is the hand that is stretched out upon all nations. For the Lord of hosts hast purposed, and who shall disannul it? And His hand is stretched out, and who shall turn it back?’ (Is 14:26,27). The Sovereignty of God is absolute and irresistible: ‘All the inhabitants of the earth are reputed as nothing: and He doeth according to His will in the army of heaven, and among the inhabitants of the earth: and none can stay His hand, or say unto Him, What doest thou? ’ (Dan 4:35).” I had never heard any living preacher talk of God in this way. But on page after page of this book, I met preachers from the past for whom God was the awesome and absolute Sovereign. Hugh Latimer wrote, “He fills the earth:that is to say He rules and governs the same: ordering all things according to His will and pleasure”. “No man’s power is able to stand against God, or disappoint Him of His purposes”. I was awed and humbled by such a vision of God. Reading that book, I was forced to acknowledge that our forefathers believed wholeheartedly in the doctrines of election and particular redemption and irresistible calling – doctrines about which I knew nothing. I remember the sense of shock with which I read an article on “The Doctrine of the Leaders of the English Reformation”: six pages of quotes from the leaders of the Reformation in England. Here is the Catechism of 1553: “The first, principal, and most proper cause of our justification and salvation is the goodness and love of God, whereby He chose us for His, before He made the world”. Here is John Bradford: “Faith and belief in Christ is the work and gift of God; given to none other than to those which be the children of God: that is, to those whom God the Father, before the beginning of the world, hath predestinate in Christ unto eternal life”. Here is Bishop Ridley: “The death and passion of Christ was and is the only sufficient and available sacrifice satisfactory for all the elect of God.”. I had never heard such things. But reading this book forced me back to the Bible where I discovered them on every page. But most shocking of all was the doctrine of conversion that I found in that book. I had to face up to the fact that my understanding of how a person is saved was very far from the view held by Bible-believing Christians in the past. I had an almost mechanical view of conversion. I had been taught that salvation is simply a matter of the will. Anyone who decides to be saved will be saved. A man has only to say, “I will trust Christ” and that man is saved. I had heard many preachers and evangelists quote Revelation 3:20: “Behold I stand at the door and knock; if any man hears my voice and opens the door I will come in..” So once a person has prayed a prayer asking Jesus into his heart, we ask no questions. He or she is saved. Such was my belief. But in the pages of this book, I found a very different doctrine of conversion. Here is the Puritan Thomas Shepard: “There are four strait gates which everyone must pass through before He can enter into Heaven. 3. The strait gate of Repentance. It is an easy matter for a man to confess himself a sinner, and to cry God forgiveness until next time: but to have a bitter sorrow, and to turn from sin, and to return to God, and all the ways of God, which is true repentance; this is hard. 4. The strait gate of Opposition of Devils, the World, and a man’s own Self, who knock a man down when he begins to look towards Christ and Heaven. Reading such words, the questions I had to face were not academic but agonisingly personal. “Am I a Christian at all? Have I ever been truly converted?” And again I was driven back to my Bible and to Christ. There were many other things I learned from that first bound volume of the Banner magazine. The life of the local church, the work of the minister, the nature of true preaching, the task of evangelism: in all these areas, I was confronted with an outlook utterly different from my own. In all these areas, I found my own thinking being reshaped. Looking again through the pages of this volume, it’s hard to believe that Iain Murray was only twenty-four years old when, along with Sidney Norton of Oxford, he launched the magazine in September 1955. Yet he was the man raised up by God to reshape a generation of evangelical ministers. I’m only one of thousands of ministers across the world who would say that they were shaped by the magazine – and then by the series of books that the Banner published from 1957 onwards. And not only ministers. I guess if I did a survey of the congregation and drew up a list of all the books that have influenced you most deeply, the list would be heavily loaded with Banner titles. Arthur Pink’s Sovereignty of God; Walter Chantry’s Today’s Gospel, Authentic or Synthetic; W J Grier’s The Momentous Event; Murray McCheyne’s Memoir and Remains: what huge impact these books have made on us. Anne recalls John Paton’s autobiography as one of her life-changing books. How could any Christian read that book without being stirred and challenged to serve Christ? It is difficult now to realise how hard it was to find books true to historic Christianity before Banner launched its publishing programme. Yes, there were individual preachers across England and Wales who were preaching clearly the historic Christian faith. Doctor Lloyd-Jones was setting a pattern of powerful expository preaching at Westminster Chapel. Through his influence many younger ministers were rediscovering the long-forgotten doctrines of God’s sovereignty. Jim Packer was forcing evangelical men in the Church of England to re-examine their doctrine in the light of the Bible and history. Yet there were very few helpful books available either for ministers or for hungry church members. Spurgeon’s sermons could only be found in a censored form which diluted his Calvinism; the Puritans had long been forgotten; the few evangelical Bible commentaries that were available were written with a dispensational slant; virtually every book on Christian living reflected the “Higher Life” teaching of Keswick. When the newly-formed Banner of Truth Trust published Thomas Watson’s Body of Divinity, no-one knew what to expect. Would anybody buy this three hundred year old Puritan explanation of the Shorter Catechism? Yet the 2,000 copies printed sold out at an astonishing rate (in all17,000 copies were sold in the first 12 years). By 1960, the Banner had published a total of thirty-five titles. And that was just the beginning. Walk into any serious Christian bookshop today and you will find hundreds of volumes written by men and women who love the doctrines of grace. That flood all began with a twenty page magazine sent out from Oxford fifty-one years ago. What hath God wrought! I thank God that he raised up the editors of the Banner more than fifty years ago and stirred them to such aspirations. Surely the ministry they began is needed more today than ever. If such warnings were necessary back then, how much more today! God give us grace to heed them. PS. 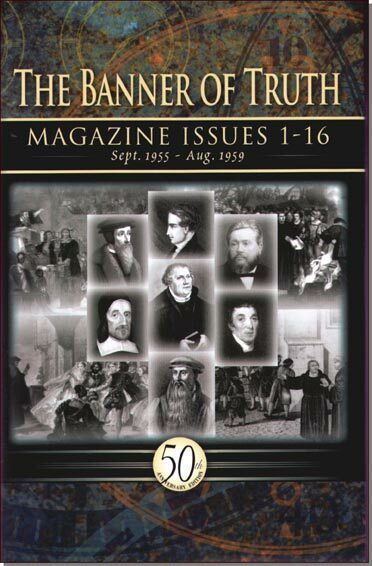 The Banner of Truth Trust has recently republished the bound volume of the first sixteen issues of the magazine. ISBN no 0851519199, £16 hb. See the Banner website for details (www.banneroftruth.co.uk).